Quiz: What's Your Cat IQ? Are you a cat lover? Take this quiz and see what you know about cat ancestry, the cat family, cat anatomy and common cat legends. A very simple short quiz, just to get the brain going first thing in the morning. Answer just ten simple questions by choosing one of the 3 alternatives and find out what your cat IQ is. If you think you are more of a doggy person, ask your cat to help you! 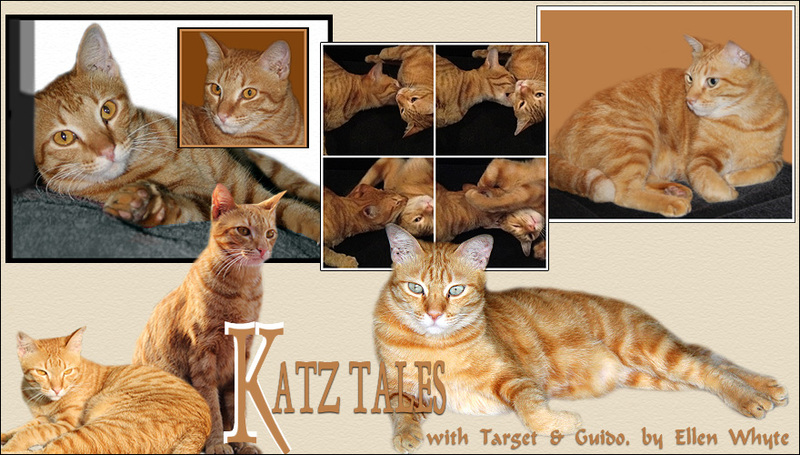 Katz Tales is out tomorrow in the print version of the Malaysian national daily, The Star. We've been out of the blog loop for a week or so because work is getting to be rather overwhelming. But while the humans are suffering from insomnia interspersed with weird dreams about deadlines and forgotten plot bits from romance novels they're sculpting (any romance literary agent looking for a finished 60,000 MS of intrigue novel please email me ew AT lepak.com!) the cats are having a whale of a time. Au is lying curled up in front of his box, paws and ears grimy with dirt because he's been rolling in the garden. He's also spending lots of time in the neighbour's house across the street, admiring their basin filled with guppies. Target has built up a formidable collection of hair bands, now called Snizzles Circles in our home, and is spending every spare minute in the office, knocking everything off my desk and pushing the Office Assistant button with his tail. And speaking of having a whale of a time, please visit Whale's Revenge and sign the petition that aims to gather 1 million signatures from people around the world demanding we stop the killing of whales. This is very timely as Japanese whalers plan to kill about 900 minke whales and 50 fin whales by mid-April this year. I'm signatory 861932 - see if you can make the 1,000,000 mark. We spent a quiet New Year at home, reading books, watching movies and waiting for midnight. Au is terrified of fireworks so he shot into the house at the stroke of midnight, eyes wide and ears flat with horror. Target took one look at the senior cat and decided discretion is the better part of valour; while Au took refuge under our bed, Target hid under the sofa. But here they are, enjoying a New Year's Day snooze on the sofa. Don't they look comfy? Wishing you a Happy, Prosperous and Lucky 2008!